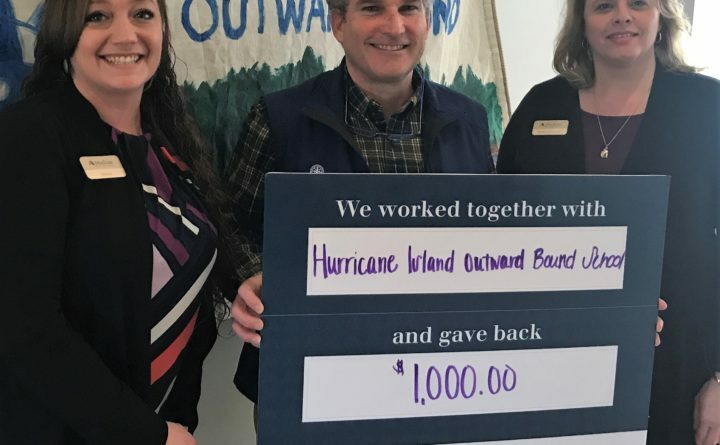 ROCKPORT — Machias Savings Bank was pleased to contribute recently to two important nonprofit organizations, Hurricane Island Outward Bound School and the Knox County Homeless Coalition. While the bank was pleased to fund the donations, they called on the community to make the decision of who should receive the contributions. For the second year in a row, the bank conducted a Vote to Give campaign as part of their sponsorship of a Penobscot Bay Regional Chamber of Commerce Business Breakfast event. With over 100 Chamber and community members casting their vote, the competition was fierce, resulting in the bank’s decision to award both a first and second place winner. Receiving the most votes and a $1,000 donation was Hurricane Island Outward Bound School. This non-profit educational organization and expedition school serves people of all ages and backgrounds through active learning expeditions that inspire character development, self-discovery and service both in and out of the classroom. The second-place winner was The Knox County Homeless Coalition of Rockport, the region’s only homeless-services organization offering comprehensive solutions for realizing and maintaining independence. “After witnessing the strong votes of support for the KCHC, we were pleased to award a second donation,” said Jones. The Vote to Give campaign is illustrative of the Bank’s commitment to the support of nonprofit organizations and activities that advance community development and improve the quality of life in Maine’s communities. With 16 locations stretching from Caribou to Portland, Machias Savings builds exceptional value for individuals, businesses, and our communities. Founded in 1869 and a leader in customer experience and community, Machias manages over $1.3 billion in assets, donates over $700,000 through contributions and contributes over 10,000 employee volunteer hours. Member FDIC. Equal Housing Lender.